We want to be your mail order source for your hobby. We look forward to providing you, the customer, with timely delivery of products and service at a competitive price. 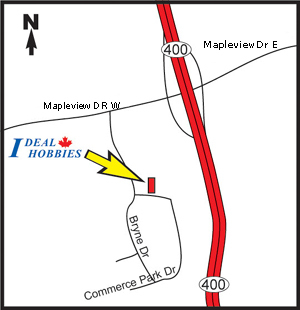 Ideal Hobbies is located at 12 Commerce Park Drive, Unit K, Barrie Ontario. L4N 8W8 (just off the 400 highway at the Mapleview Drive exit) . We welcome you to drop into our showroom, and browse our product lineup. We stock over 10,000 different Radio Control and General Hobby items in our 2200 sq' showroom.